As I struggle to find something to write about, on this blog, about my life and the disease, the cancer I carry, it’s hard to pout the emotions into words. – Should I wear my “Happy Face” today? – I know why I didn’t see that coming! – Don’t you love how real my new eye looks? I could go on but that would be giving away most of my game…lol. Life gives you what it will and you’re responsible how you handle it. Take it from me, it’ better to do it with a smile than a snarl. For some reason my blog database crashed but I have now fully restored the blog. No winners. No Losers. Just a guy less an eye. My auction of ad pace on my soon-to-be-installed ocular prosthetic grabbed the attention of almost 1,200 people on Ebay and countless more across Canada and the world. 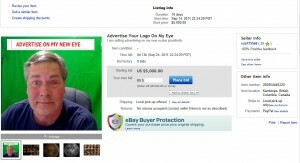 The national attention I received with my plan of auctioning off logo space on my eye was simply amazing. Those that brought my story forward deserve kudos for bringing ocular melanoma to the attention of thousands, maybe even tens of thousands (or more) people across Canada and elsewhere. – that ocular health rises on the list of “health watch” topics so more people will have their eye exams and potentially save the sight they have because of early detection. It would be great to see daytime television spend a few minutes a month talking about the importance of eye exams, symptoms of eye cancer (as rare as the symptoms are) and eye safety. Life is not only for the seeing, it’s for the doing. But sight is the most important part of that equation in my estimation. Keep it with all of your might. 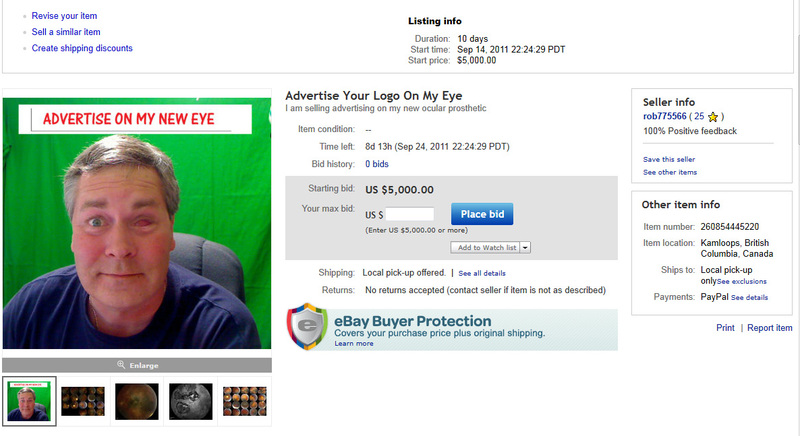 I am considering holding another auction but some things will need to be clarified by Ebay first. For instance, to be a charity auction on Ebay.com (US) you agree to donate 10% of the final auction price should the item sell. In Canada, Ebay.ca the rules clearly state that you agree to donate “at least 100%” of the final price. Weird, to say the least. See picture below. Click on image for full size view. Click on image for full size view.